The Maldron Hotel became Cardiff's newest hotel when it opened for business on the 16th May 2011. 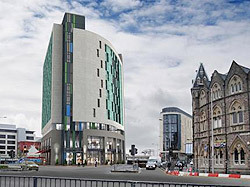 The Maldron Hotel is located at the bottom of St Mary Street, adjacent to Cardiff Central train station, and has been built on the site of the old Central Hotel. This brand new 3 star hotel offers 216 air-conditioned guest rooms in a very convenient location, with easy access to the train and bus stations, the Millennium Stadium, Cardiff Motorpoint Arena and St David's 2 shopping centre. Brand new hotel in very central location. Less than 2 minute walk to Cardiff Central train station. Approx 5 minute walk to either the Cardiff Motorpoint Arena or Millennium Stadium. Business centre with 9 conference rooms.